Fig. 1. 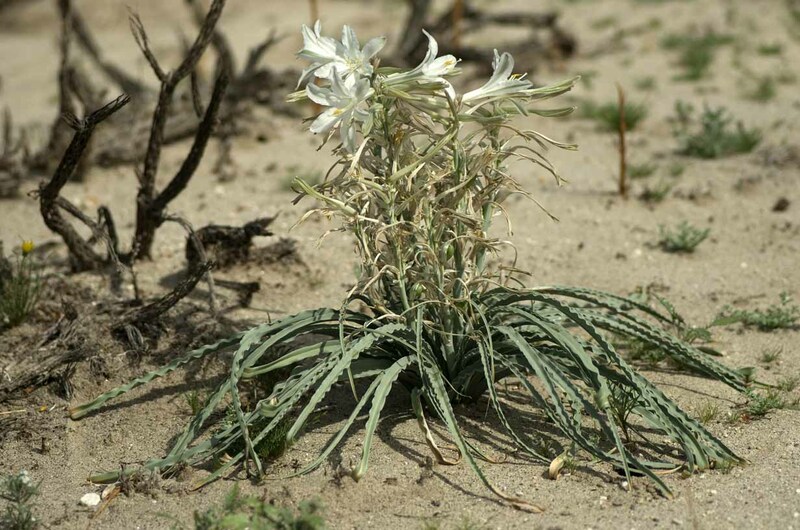 The same plant of desert lily, Hesperocallis undulata, photographed by Bill Sullivan on 25 February 2016 (left) and on 4 March 2016 (right), an interval of eight days in which it went from its first blooms to its last blooms. 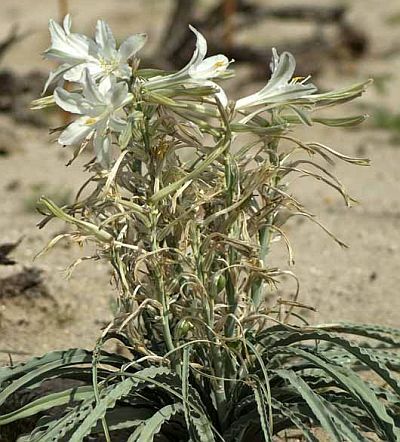 See Background Information for Bloom Reports from the Anza-Borrego Desert for an introduction to this page, extensive general information (not specific to this year) about Annual Germination, Growth and Blooms, including what influences the duration and extent of the annual bloom. The Borrego Desert is now in full bloom, but the area with peak bloom has moved to higher elevation, with the peak bloom being in the canyons and elevations just above the desert floor. The bloom on the desert floor is winding down, with a number of plants now in fruit. There are still blooms on the desert floor; just not as many as there were a week ago. This glorious desert lily season is winding down. See Bill Sullivan's pictures above of the progress of one plant, which went from its first blooms to its last blooms in just eight days. Overall, this bloom season is closely tracking the 2012-2013 bloom year in the number of species in bloom on an average trip. The plot of the number of species in bloom vs. time for the last eight years for this year (solid black line) is following closely the turquoise line for the 2012-2013 season. 2012-2013 was a decent bloom year, but somewhat subpar compared to other years. This year is better than 2012-2013 in having had many more annuals in bloom on the desert floor. This year, the bloom is much more variable with location than normal. Oddly, in a flip of the normal situation, many washes are much less floriferous than normal, with bouldery spots producing some of the best flowers. Although most of the annual plants on the desert floor are significantly smaller than what would be seen in a good year, with many fewer flowers, that is not unusual for an average year. The perennials and shrubs look happy with the rainfall they got, even though it was below normal. As is often the case, some species have responded well to the unique rainfall pattern of each year. 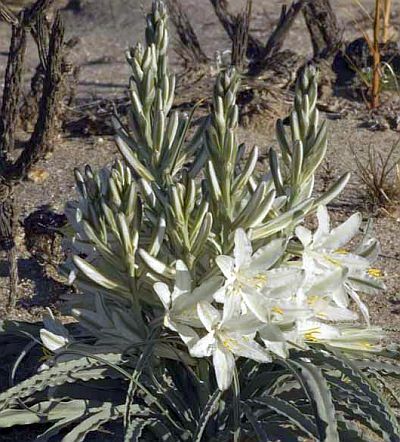 For example, desert lilies, Hesperocallis undulata, had an excellent year, with abundant blooms on numerous plants. The wonderful news about the lack of Sahara Mustard, Brassica tournefortii, continues! For the second year in a row, the mustard is not the dominant plant on the sandy desert floor in most places, allowing us to see our native plants blooming there (See Sahara Mustard Reduction in Numbers in the Borrego Desert Floor in 2015). We expected a much better and more widespread bloom this year from all the super-El Niño hype, and the predictions of two inches of rain in the desert in October 2015 that never materialized. Unfortunately, this year has been yet another below-normal rainfall in the Borrego Desert. There was only a single rainfall event in the Borrego Desert, of two inches in and west of Borrego Springs on 5-6 January 2016, and of just an inch or less east of Borrego Springs. This produced good, but somewhat spotty, germination in and west of Borrego Springs, but only very scattered germination east of Borrego Springs. There was only one small rainfall event after that, on 31 January 2016, of just 0.04 to 0.4 inches in Borrego Springs, and nothing east of there. Conditions were almost the exact opposite of what it takes to produce a good bloom. The germinating rainfall was late, followed by a month of temperatures ten degrees colder than normal that produced almost no growth for the annuals. Then the weather suddenly turned hot, with temperatures ten degrees warmer than normal. The lack of further rain, and the warm temperatures, caused the annual plants to begin blooming when they were very small. For example, the desert sunflower, Geraea canescens, are starting to bloom when they are just one foot tall or less, about half their usual size (see Fig. 1). These smaller plants will produce many fewer blooms than normal-size plants would. 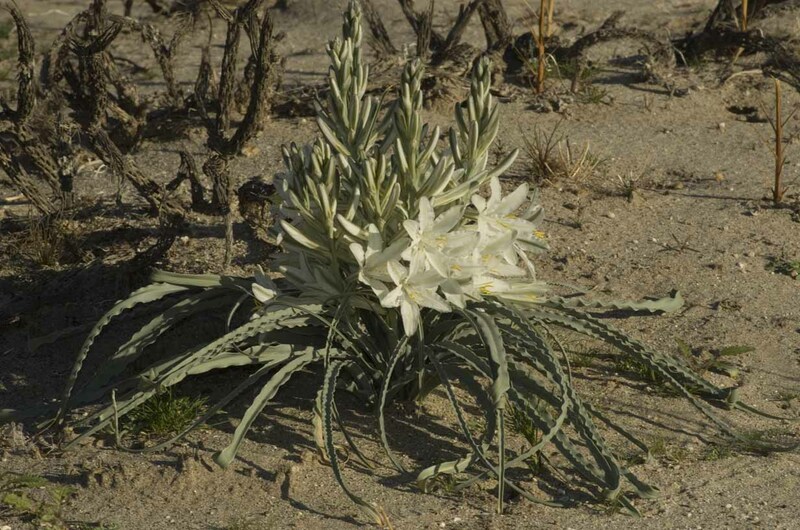 See List of species observed in bloom on 26 February 2016 from a drive down Montezuma Grade (beginning at 3000 feet elevation in Culp Valley), and from three locations on the desert floor northeast of Borrego Springs. A few areas just south of the eastern Santa Rosa Mountains, such as the Truckhaven Rocks area, received some significant rain in September and/or October 2015. That caused spotty germination in that area, especially in locations where water pooled, and produced scattered plants that were huge and blooming in January 2016. That included the largest plants of Plantago ovata, Cryptantha maritima, and C. barbigera var. fergusoniae we've ever seen. Even though we hike ABDSP frequently, it is simply not possible for us to know current conditions at all locations in such a large area; we only know what we've seen in the specific areas we've recently botanized. In particular, things can literally change overnight in the Borrego Desert. We've seen a great bloom in Glorietta Canyon go to almost nothing after a single wind event. With that caveat in mind, for a timely report on Fred and Carla's almost-daily hikes, see their Anza-Borrego Wildflowers Guide. For a recommendation on where to go for the best blooms, your best bet is to go to the ABDSP Visitor Center, at the west end of Palm Canyon Drive, or to the Anza Borrego Desert Natural History Association store, near Christmas Circle in the center of town on Palm Canyon Drive, on the day of your visit and ask them. They get reports from lots of people about the best current spots, and can point you to good places that might be less crowded, taking into account the capabilities of your vehicle, current road conditions, and your time constraints. They also know what the weather is like on a given day, so you can avoid ending up in areas with blowing sand from 30 mph winds, or areas with no wind and 95 degree heat. What you see is what you get; we're at peak bloom. Peak bloom at any given location is likely to be shorter than normal due to the lack of good rain this year. 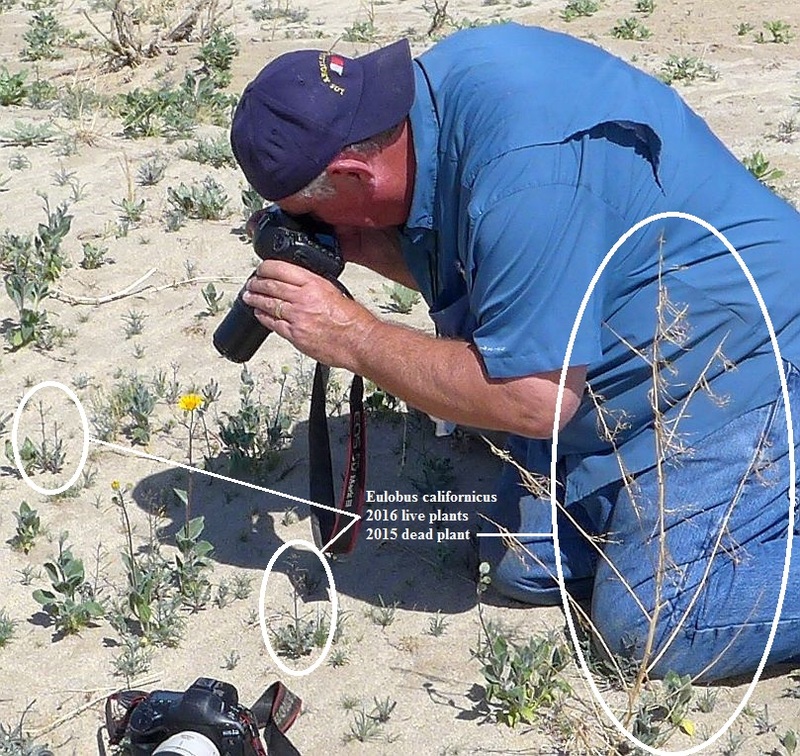 Anza-Borrego Wildflowers Guide by Fred Melgert and Carla Hoegen, with daily wildflower updates. Wildflower Updates from the Anza-Borrego Desert Natural History Association, often with daily updates from Fred Melgert and Carla Hoegen, and other reporters. Copyright © 2008-2016 by Tom Chester, Kate Harper, Fred Melgert and Carla Hoegen.